PS-Can you guess what you 3 are getting for Christmas this year??? *Pooch-i = pucci. Get it?? WHY didn’t we take a picture? It would have made a great candid camera video. I still chuckle every time I think about it. Of all things to accidentally shoplift? A pink sparkly furry dog purse? PS. Love the new blog header!! Oh, wait, Malia is on to something. You wanted that furry dog purse and this “accidental” shoplifting story is all a big scam to cover up the truth. I say go for it! Embrace your inner 4 year old! Check out my blog, I’m having an apron giveaway! I’m cracking up over here! I don’t know what was funnier…the look on Jen’s face as she chased you out of the store…or the look on your face when you realized you had a stowaway. That is hysterical!!!! Love you my darling roomie!!! I saw the puppy picture and immediately recongized that it was my daughter’s dog, Frenchy and her carrier! Really, my daughter has the same dog and carrier that she received as a gift during our family trip to Ocean City, Maryland. Your story was really funny! I must be the odd one out here because I think that Pucci Pet is adorable! 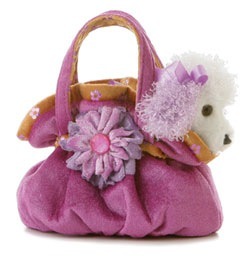 We have a thing for poodle purses around here.